Thousands of delegates from around the world gather in San Francisco this week for the Global Climate Action Summit. Committed to achieving the Paris Climate Accord’s goal of net zero emissions by midcentury, the international effort is humankind’s attempt to save itself from itself. For a quick glimpse at their prospects, delegates should come to Fresno. Our city is at the crossroads of California’s climate change policies, in the heart of a valley that has been trying unsuccessfully for nearly three decades to reduce ground-level air pollution to safe levels. The two efforts share a common feature: cap-and-trade, the market-based system designed to reduce air pollution through the buying and selling of pollution credits like commodities. It’s a trading system structured to ensure economic stability, and it does lead to less air pollution … only very, very slowly. San Joaquin Valley residents have been waiting 28 years and the end is not in sight. How long does the planet have? For greenhouse gases, California sets a good example. Our efforts to decarbonize are underway, and a long list of courageous state legislators have taken turns leading the effort. Governors from Gray Davis to Jerry Brown and laws ranging from former state senator Fran Pavley’s 2006 Global Warming Solutions Act to this year’s 100 percent Clean Energy bill authored by Sen. Kevin de León have placed the state on the right path. These policies are still evolving and improving. That’s to be expected given this is the largest undertaking in California – in human – history and that policymakers face almost unanimous resistance from fossil fuel, industrial, and agricultural interests. Despite cap-and-trade’s industry friendly approach, for decades lobbyists for these sectors have worked to delay or block every air pollution rule and regulation. From cars’ carbon monoxide and diesel trucks’ toxic fumes to ammonia from dairies and methane from oil fields, we continue to inhale a long list of hazardous pollutants. Countless lives have been damaged or lost. The response to greenhouse gases has been no different. The stakes are just so much higher now, and we’re quickly running out of time. Local politicians have proven especially disappointing on this front. In recent years statehouse representatives Michael Rubio and Henry T. Perea, both Democrats, left office early to end up as oil industry lobbyists, and the Fresno City Council has been voting unanimously to ignore state laws requiring industrial developments assess and mitigate ground level air pollution and greenhouse gases. Most impacted are the residents of Malaga, Calwa, Daleville, La Vina, Lanare, and a long list of other vulnerable communities. These families already bear the brunt of industrial and agricultural air pollution, water contamination, and toxic emissions, but climate investments in high speed rail, dairy digesters, biomass plants, and more are resulting in even greater impacts. Take high speed rail. Making and pouring concrete is one of the most greenhouse gas-intensive activities there is, and the greenest buildings are the ones already built. So due to HSR’s many years of construction and demolition, it will be decades before the greenhouse gases emitted now might possibly be offset by reduced passenger vehicle emissions. Meanwhile, people living alongside the construction route throughout Fresno are inundated with dust and diesel when what they need are basic, electrified transit services which, importantly, would immediately reduce greenhouse gases and criteria pollutants alike. Even worse impacts are being caused by the state’s headlong rush into biofuels of every type. Dairies are being subsidized to produce methane rather than avoid it. Wood is being ground, hauled, and burned in highly polluting biomass plants rather than being incorporated into soils, spread on dusty roads, or kept in solid form. Again, residents of vulnerable neighborhoods are being assaulted by increased pollution. Our best hope is for the California delegation to return home from San Francisco – with a side trip through Fresno – with a newfound sense of urgency and commitment to funding a just transition. 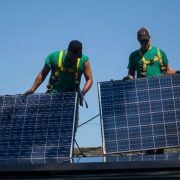 One that protects life rather than imperils it, prioritizes local jobs in clean energy, and results in a stable atmosphere as soon as humanly possible. Kevin Hall has lived in Fresno since 1971, where he works as an air quality advocate and community organizer. 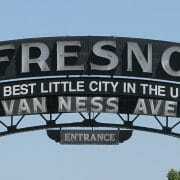 Fresno sits at the crossroads of California’s climate-change policies, by Kevin Hall, The Fresno Bee, September 10, 2018. Together on the rooftop were stakeholders in the Valley’s environmental, social, and economic development. These included community-based organizations, elected officials, and government agencies that work together, sometimes as adversaries, to improve the lives of Fresno and San Joaquin Valley residents. Also included was Joaquin Arambula, a newly-elected assembly member who represents Fresno. Community-based organizations have worked hard to ensure that development in the Valley includes historically neglected communities, as identified by California’s “Enviro Screen” mapping tool. While mostly agency representatives and electeds shared the Mayor’s vision, the advocates in the audience want investments to be made in West Fresno, Southeast Fresno, and over 20 more Valley communities designated as the most disadvantaged in the state. 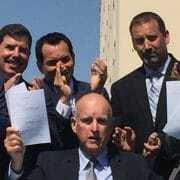 As bill authors eagerly stood behind the Governor, waiting for him to sign their piece of history, Governor Brown described why these climate change bills were good for the Valley. He warned if we don’t do something about climate change now, the Valley’s hot temperatures will create unlivable conditions. He also remarked on the opportunities to capture methane from dairies, saying, “The dairies…you know what it is, that could all be clean energy.” That statement struck a chord with the advocates who have been working to be included in the discussions on the use of dairy digesters. While the new technology promises to reduce greenhouse gases, the indirect impacts to nearby communities, whether this is the most efficient and inexpensive way to reduce methane, and the degree to which the technology will perpetuate mega dairies in our Valley, are all issues that have not been thoroughly assessed. Among the bills signed by the Governor was AB 1550 authored by Assemblymember Jimmy Gomez (D-Los Angeles) which seeks to resolve a lesson from Cap & Trade auction proceeds. While the current program ensures 25 percent of funds benefit disadvantaged communities, with 10 percent spent directly in those communities, many advocates soon realized in “in benefit” create a loophole that left out communities in need. The new rules require at least 25 percent of funds go to projects within and benefitting disadvantaged communities and at least 10 percent for low-income households. AB 2722 by Assemblymember Autumn R. Burke (D-Inglewood) provides big-picture strategic investments allowing communities to draw funds from multiple sources under the cap-and-trade program, to provide local benefits through a holistic, rather than piecemeal approach. Funds will be directed to a grant program run by the Strategic Growth Council for greenhouse gas emission reduction projects that provide local economic, environmental and health benefits to disadvantaged communities. The Central Valley Air Quality Coalition (CVAQ) supported AB 2722 during their annual Clean Air Action Day in Sacramento, where over 30 individuals met with legislators to discuss clean air priorities for the San Joaquin Valley. Burke’s bill ensured $70 million to come to Fresno alone, half of the funds geared to fund neighborhood-level transformative projects that reduce greenhouse gas emissions and provide local economic, environmental, and health benefits in disadvantaged communities. The Strategic Growth Council (SGC) that administers the funds came to Fresno on November 7th to hear from the public on how to administer the $70 million in Fresno. They heard from local elected representatives and countless advocates all pointing to their priorities for the funds before the agency continues administering the program. Where the funds will be allocated in Fresno is the biggest question the SGC will have to balance. The Mayor’s office is pushing for investments in Downtown and High Speed Rail corridors while advocates again had the opportunity to raise West Fresno, the community that has been left out. Coincidentally, the City created a separate General Plan planning process for the community, the Southwest Specific Plan. With this plan to be approved by City Council next week, the SGC has a blueprint of how to invest funds in the most disadvantaged communities. The community will be waiting to see how they balance the interests and needs of community residents and elected officials. The Governor also signed AB 1613 and SB 859 which details the $900 million cap-and-trade investment plan. With the signing of these bills comes opportunities for organizations, agencies and community residents to advocate for the communities most in need in Fresno and across the Valley, even while potentially challenging popular plans such as, the Governor-Fresno Mayor’s office alignment to invest in the Downtown-High Speed Rail areas. While we all share the same goal of reducing the effects of climate change, we will need to work together to ensure the strategies we support, benefit everyone and especially those who are burdening the impacts. 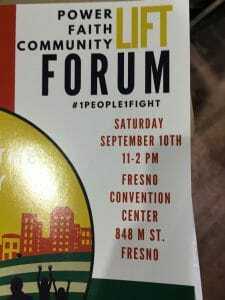 I attended the Faith in the Valley: Power Faith Community Forum at the Fresno Convention Center on Saturday, September 10th. Nearly 2,000 participants, including Fresno mayoral Candidate Henry Perea and numerous congregations from throughout the San Joaquin Valley, gathered for an afternoon session dedicated to three issues our community faces: environmental, racial, and economic. 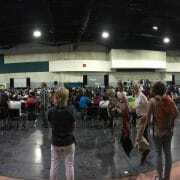 Faith and community leaders presented ideas that were then discussed in breakout sessions by attendees at their table. I distributed information about Community Choice Energy (CCE) being promoted by our Clean Power Exchange program. Various attendees talked with me about Community Choice – how it provides electricity from clean energy sources via a not-for-profit public entity, and how it could benefit the Valley from both an environmental and economic standpoint. As several areas utilizing CCE in the Bay Area like Sonoma County with Sonoma Clean Power and Lancaster with Lancaster Choice Energy have proven, CCE provides lower rates to utility users compared to what the big utility offers, meaning more revenue is invested back into our economy. Utilizing clean energy sources to power our electricity will reduce our greenhouse gas emissions, reduce the need for fracking that contaminates groundwater, and offset the particulate air pollution our Valley residents breathe in on a daily basis. “Faith in the Valley community leaders have been excited to learn that voters and ratepayers have more opportunity than ever before to negotiate for these concrete, life-saving changes through Community Choice Energy,” Weiler stated. Events such as the Faith Forum are a powerful way to spread news about the benefits of Community Choice Energy and other programs; people seemed very excited by these solutions and the prospect of a better future for the Central Valley. Perhaps the biggest point raised during the event was that if we all stand together, we can make these visions a reality. Community Choice Energy is a prime example of how we can address our global climate crisis in a meaningful way at the local level. If events like these are any indication, Valley residents are ready for this. Program cover for Faith In The Valley Forum. Faith in the Valley: Faith Community Asserts Support for Energy Democracy, by Erik Cherkaski, Clean Power Exchange, September 29, 2016.